PlateRite FX1524 / 1200 | SCREEN Graphic Solutions Co., Ltd. 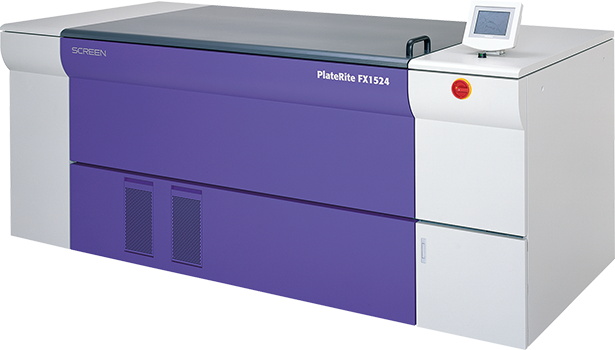 The PlateRite FX series are high-quality, easy to use, reliable CtP recorders that offer optimal fl exo/letterpress plate output for printing and prepress companies. They can image the black mask layer of resin plates directly, thereby eliminating the need for fi lm and other intermediate processing. This results in more effi cient operations, as well as more consistent output quality. What’s more, the PlateRite FX series units’ superior halftone dot reproduction ensures consistently high quality printing even in the highlight and shadow areas. The PlateRite FX1524 and FX1200 are designed for a wide range of uses, including the production of labels, fl exible packaging, cartons, and corrugated packaging. 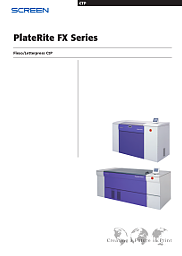 Consistent plate qualityThe PlateRite FX1524 and PlateRite FX1200 eliminate many of the problems associated with platemaking using film, including image unevenness, problems caused by dust, and UV scattering. They also eliminate the many problems inherent in going from film to plate, such as misalignment of the film during platemaking and registration errors arising from stretching of the film. This helps ensure consistent plate quality and reduces the waste inherent in repeating plate output due to errors. Proven technologyThe light source used by the PlateRite FX units, a multi-channel laser diode, is the same type of laser as those used in Screen’s traditional offset CTP recorders. This proven, reliable, high-powered laser images the black mask layer of resin plates. In addition to enabling sharp imaging, the PlateRite FX units’ light source is both long-lived and inexpensive to operate. 4,800 dpi resolution for high-quality outputThe PlateRite FX1524 and FX1200 offers a maximum output resolution of 4,800 dpi. This high resolution significantly reduces the incidence of problems common in low-resolution output, such as jaggies in diagonal lines and curves, and dramatically improves the repeatability of fine line reproduction. Easy OperationLeading and trailing edge clamps save the operator time and trouble when 1,067 × 1,524 mm (42.0” × 60.0”) plates are used. The PlateRite FX1524 features a button operated loading mechanism, which loads plates reliably. Manual plate loading is also available, and the operator can choose the optimal plate loading procedure depending on the size of plate being used. Note: The minimum supported plate size is 200 × 200 mm (7.9” × 7.9”). Note: Thermal ablation film support is standard with the PlateRite FX1524 and FX1200. *1 Supported by the standard configuration, but a 4,800 dpi screen must be purchased separately. *2 Productivity vary slightly depending on media sensitivity. For more information about our products, sales or technical information, please contact directly to our local offices. Copyright © 2019 SCREEN Graphic Solutions Co., Ltd.